Training iBJJ requires a lot of gear to help you hold your ground and protect you from fatal injuries. These can include gi, pads, rashguard or any headgear but how would one carry all of this stuff around? Obviously, you wouldn’t want to gear up when you leave home, that would be quite a nuisance. Thus, you need a bag that has enough space to carry all of that stuff. The thing what you need is a BJJ GI BAG! However, normal bags will not cut it so you need one that is made specifically for BJJ gear. Some of the features these bags have are that they are resistant to wear and tear have different compartments or pockets that are designed to hold certain items and have incredible breathability. 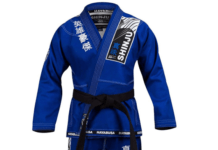 Some of the best BJJ GI bags available on the market are shown below. The Mesh Gear bag from Hayabusa has very high breathability, it keeps everything well maintained. 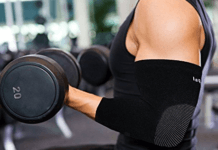 You would be surprised to see how fresh everything is when you get home after a long tough workout. The mesh fabric of the beg helps in speeding up the drying process all the while draining the air out of the soggy and wet equipment. The bag is also very spacious, you can fill in all your stuff and it will hardly feel congested. 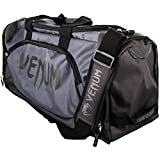 The Venum trainer Lite is another great choice because it features a large compartment in which you can store all your gear, there are also subsections where you can place your sparring gloves, knee pads or your GI. 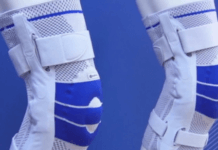 There are also panels on the side that offer the option of more store and a small separate compartment for keeping small gear such as a mouth guard. Like all good BJJ bags, it also has a mesh design for breathability. 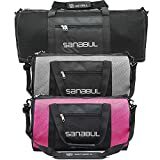 One of the best things about Sanabul hybrid bag is that it can be used in many different ways, such as a shoulder bag, bag pack or a duffel bag. This is because of the many adjustable bubble foam padded shoulder straps on the surfaces. It is a very versatile bag and has high durability; this bag was designed to be your ultimate companion wherever you are headed. There are also lots of compartments and it is large enough to hold all your gear. The Fuji Sports High Capacity Duffle Bag has many features like ventilation to prevent odor from your gear, many ways to store your equipment and a high storage area. The top panel can be removed to help with convenient loading and unpacking and there are side end pockets to store smaller gear. Another specialty is the internal webbing which divides the space into more compartments. It also has a foam pocket for storing electronics. The Datsura duffel bag has taken inspiration from military gear. It is made in a way which is close to a general military specification. The construction and design are done with high quality and robustness. This has multiple compartments to store your gear and has specifics for storing each piece. The durability is also very high as it is made of tough polyester.